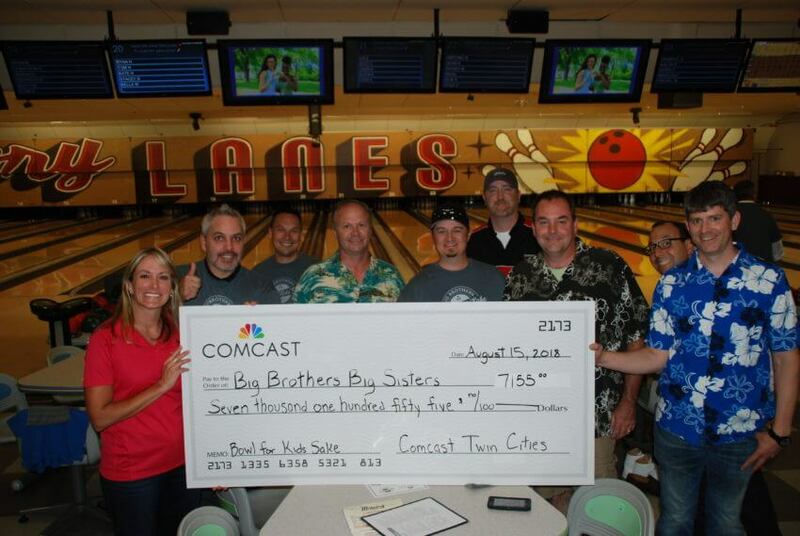 The 2018 Comcast Bowl for Kids’ Sake on August 15, 2018, brought more than 60 bowlers together to raise money for Big Brothers Big Sisters Twin Cities. Thank you to Comcast Twin Cities for sponsoring this event and all of the awesome teams for bowling for kids’ sake! Together, Comcast and their employees raised $7,155 to match Twin Cities kids with mentors and create meaningful programs and activities that prepare them for their bright futures. Bowl for Kid’s Sake is the perfect way for companies to make an impact on our community – it only takes a little bit of effort to raise the money that is vital to our kids success. Each year, half a million people across America come together to have fun and raise money to support Big Brothers Big Sisters through BFKS! Want to get involved? Big Brothers Big Sisters would love to partner with your business, group or with your individual participation during our annual Community Bowl for Kids’ Sake in August 2019. Contact Micaela for more information!